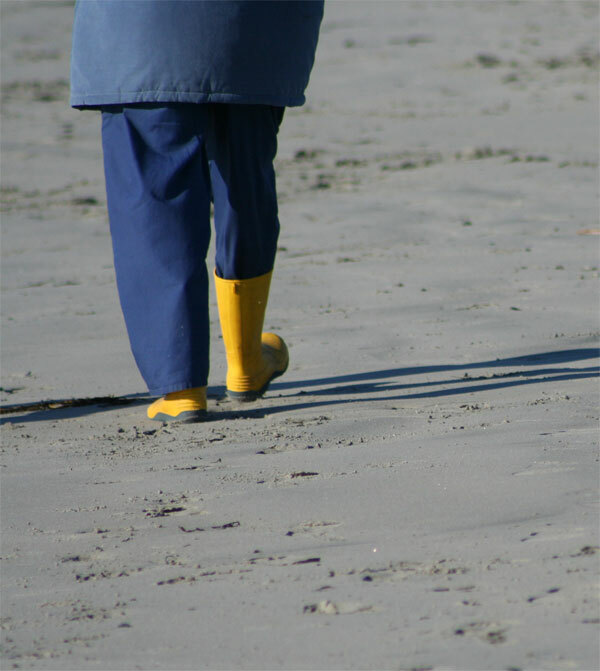 Crescent Beach is a popular summer destination, near Lunenburg, but we prefer to walk the beach in the winter. 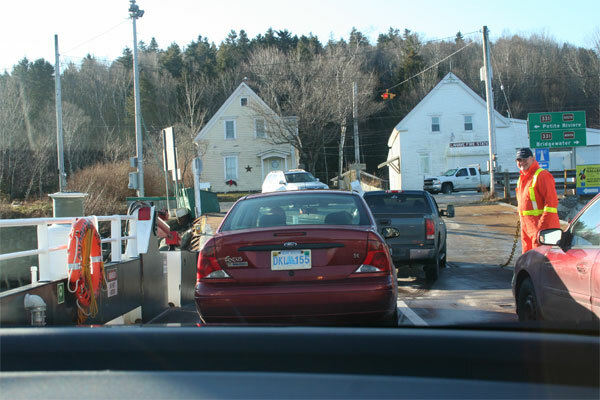 The quickest route there, is to go by the LaHave Ferry. Here is a link to the Google map of the beach and the Islands. 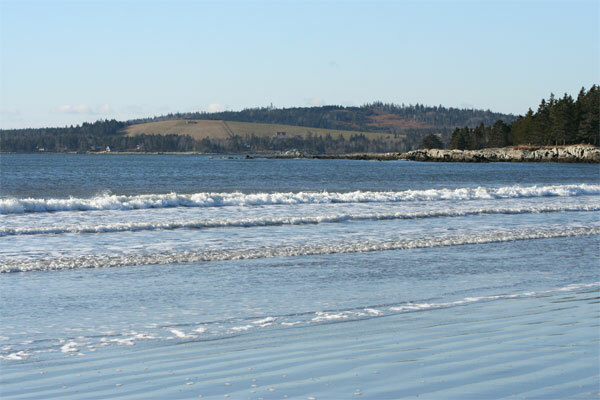 The sand bar connects some of LaHave Islands to the mainland. 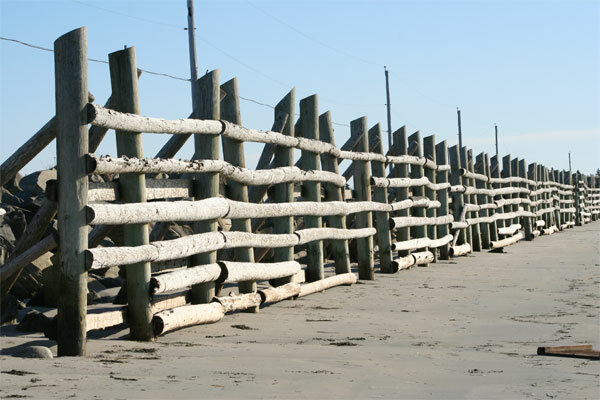 A large post fence was build in the 1930’s to protect the sand dunes, but after damage to the road in 2007, huge rocks were placed behind the fence. Looking over to Green Bay. 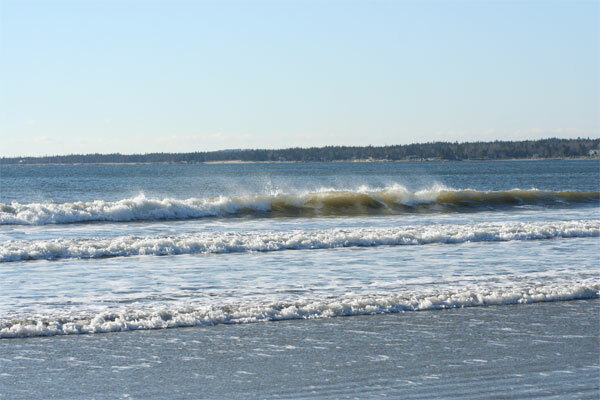 The beach slopes gently and is a safe place to swim. This bright footwear made me smile. This boat house sits on bush Island. 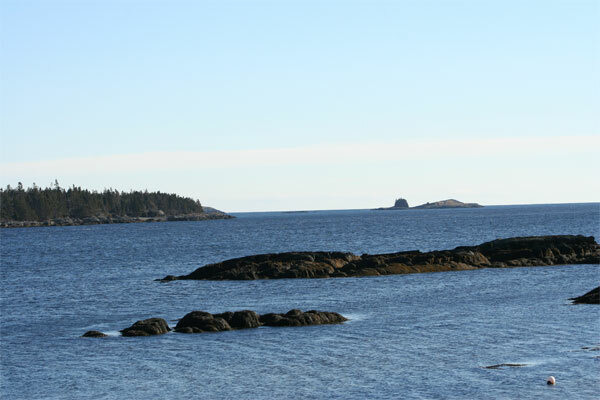 You can see the bridge behind it which takes you onto Jenkins and Bell Islands. 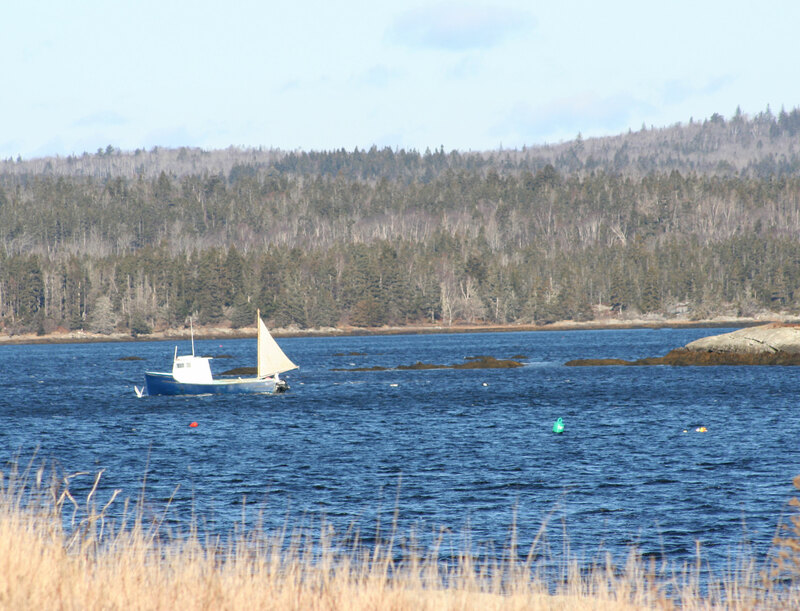 We watched this lobster boat picking up its traps as we sat and had our picnic. The sail seemed to be to keep it steady while the lobsterman lifted the creels. Looking through to another cove. I always think this looks like a Scottish castle sitting on the rocks, but I think it is just a group of trees on the Thrum Caps. 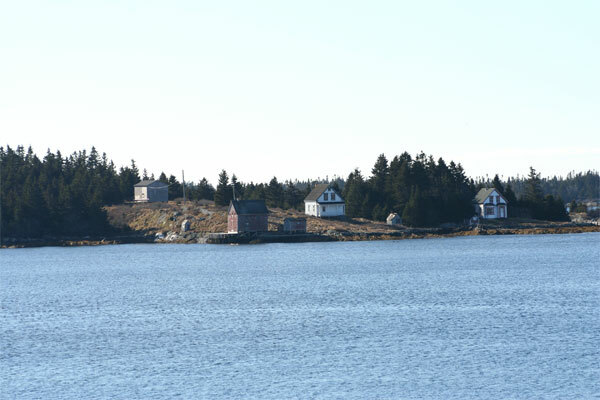 It must be pretty idylic to spend the summer in one of these cottages on Bell Island. I’m not sure about the winter though. 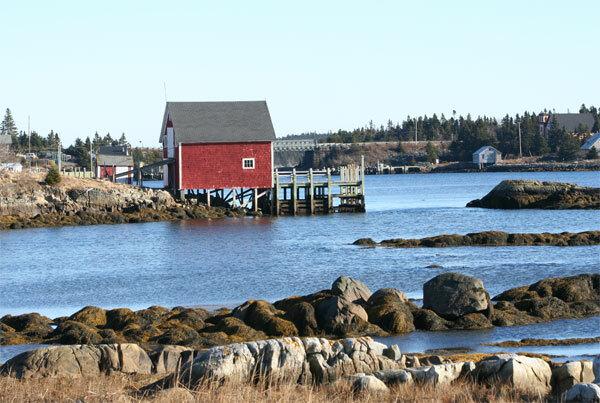 Last Saturday we walked one of our favourite walks, from Green Bay to Broad Cove. 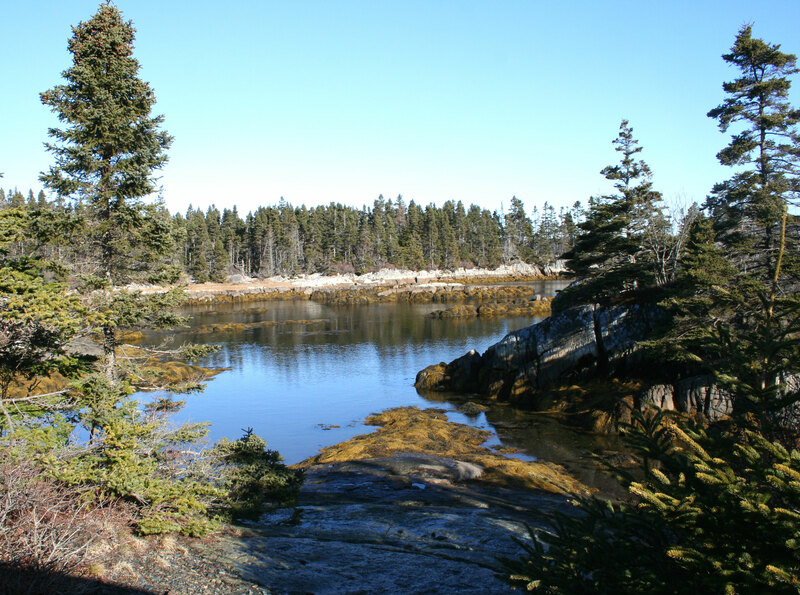 This is only about an 8 mile walk but as there is some rough walking over rocky areas and even some streams to ford it took us a total of 4 hours – that’s with a good long picnic at Broad Cove before we returned to Green Bay. Some of the walk is around pretty little beaches. Then there are rocky foreshores to tackle. 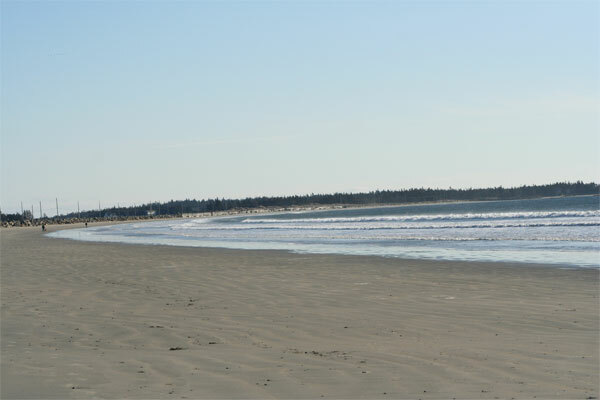 Then trails through wooded areas with the beach on one side and lagoons on the other. There were little boats fishing and using a sail to help them move along. We spotted this unusual bird at Broad Cove, while we were having our picnic. I managed to get only this one photo, before it flew off. I found it in my bird book and it is a Belted Kingfisher. My book says that these kingfishers teach their young to fish by stunning a fish and putting it on the surface of the water, then the young practise diving for it. We headed home and while we waited for the little ferry to take us across the La Have River I got this photo of the amazing Loon. He wasn’t happy about me taking his photo, so he dived under and came up well off shore. The Loon’s call is a really haunting cry, a lou-lou-lou; a bit like the curlew, our favourite bird from Glenshee. Here comes our ferry to take across to the Lunenburg side again. Ice fishing is a completely new experience for us coming to Canada from the UK. But for those who live by lakes or rivers it is a real winter sport. The river estuary of the La Have that runs to Bridgewater is very like the River Tay at Dundee as it goes upstream to Perth. Once the temperature goes to freezing the La Have freezes over completely. This is quite amazing as it is salt water. We saw our first ice fishers last year and then a couple of weeks ago they were out in force again. There are various forms of shelter used by the fishermen. Some seem to have portable huts that they drag out onto the ice. These huts come complete with a stove for warmth and probably to cook the fish. Others have sort of tent like structures that are built on site. This looks like someone’s garden shed. The first rule of ice fishing is to be certain that the ice you are fishing on is safe. As a general rule, you should wait until there is a minimum of 6 inches of solid ice on a river or lake before attempting to fish on it. There are also different types of ice, and it is wise to familiarize yourself with all of them before beginning. “Black ice,” is the name given to patches with ice that are mostly clear, and containing only air bubbles. Black ice is considered safer than the deceptively-named, “white ice,” which is not clear, and contains melted snow that has re-frozen. In general, ice fishing beginners should avoid white ice altogether. Holes are cut in the ice with some form of auger and then the fisherman is ready to start. I read that sonar units are used to show you where the fish are, otherwise you miss out on the true joys of ice fishing!! I think these lads are having a sleep while waiting for the fish to bite. But ice fishing is not a solitary sport. In fact all the books say that you must not do it alone, for safety reasons. Normally where you find one fishing hut you find several. It seems to be a real social event, with many groups totally engrossed in the sport. I really enjoyed fishing for mackerel off the piers in the summer and always enjoyed sea fishing , but I can’t really see myself getting into this ice fishing. Maybe I’m just too old for this unfamiliar activity.